I have a mesh which I have imported from an OBJ file. I would like to apply Material A to the section of the mesh which is on one side of a given plane, and apply Material B to the section of the mesh which is on the other side of that plane. A potential plane is indicated here as a blue line. Note that it does not necessarily intersect the centre. To do this, I need to split the any faces which intersect this plane, and select all faces on one side of the plane so that I can apply a material to them. How can I do this in the current versions of Blender? I've tried using the K knife tool in Z cut-through mode, but the cuts haven't been reliable. Even when they were, after the cut was finished I couldn't figure out how to select only the faces on one side of the cut. (The details were too fine to be reliably selected with any tools I know, such as the C circle select tool.) I tried using the B selection tool, but it only selected the faces on the near-side of the mesh. 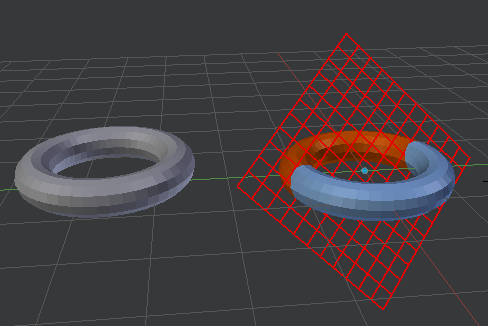 We used to have a procedure to cut a mesh using a plane in Blender 2.4, but it involved using mesh boolean tools which appear to have been replaced, and I can't figure out how to adapt it. Enter edit mode (Tab), then press Space and type in Bisect, or select Bisect from the toolshelf (under Add). Click and drag, to bisect the object. Press F6 to bring up the options for the tool, and select clear inner, or clear outer depending on which half you don't want. Assign a second material for the selection. Done. If you want to create two identical halves from a symmetrical mesh, all you need to do is to tab into Edit Mode and press Numpad 5 then Numpad 1. Now you can press B for Box Select and drag over the vertices to one side of the center line, then delete those vertices. This method can be used to make Vertex Groups for easy selection, so you can assign materials. Notice that your selection will be limited to the vertex locations, and no new geometry will be created to ensure a straight line. Just to add a more procedural way to do this cutting thing. This is one solution if using Sverchok Add-On. 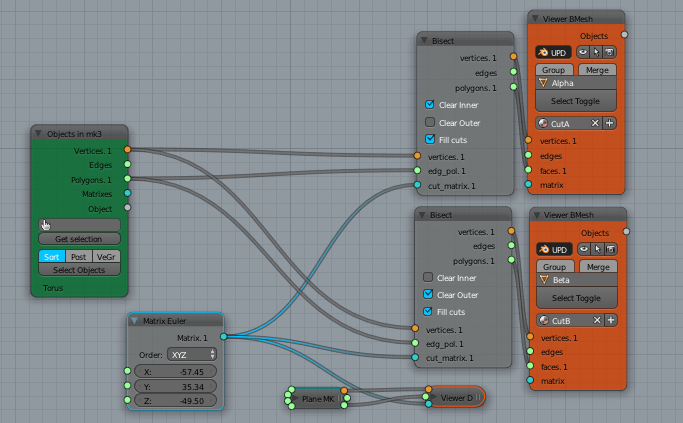 The cutting is done using Bisect Node, very similar to Blender's Modeling own Bisect operation. You will end up with 2 new objects in this case, but you can join them if you like.